Advanced persistent threats, or APTs, are a high priority for IT security professionals because of their potential impact on the enterprise. In fact, APTs can compromise a wide variety of different defenses because instead of just relying on malware, they usually involve human beings who are better able to adapt their attacks and ultimately compromise the target network. 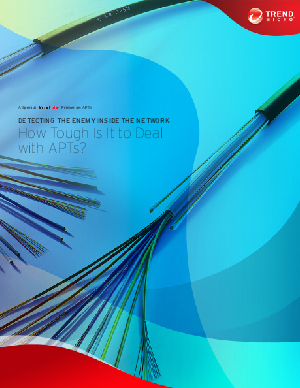 Of course, a better understanding of APTs can help prevent these types of attacks and perhaps give both business leaders and network administrators a little more peace of mind as well as allowing them to focus on other challenges. This free white paper provides a comprehensive overview of the threat as well as the advanced protection that enterprises can now use to protect their networks and information. Discover how the leading solutions provide vulnerability management services and deep security. Malware is bad but APTs are downright evil. Download this free white paper to find out how Trend Micro can protect you and your business against an evil insider.